The Indiana State Soldiers Home opened in West Lafayette in 1896. Its residents were "honorably discharged soldiers, sailors and marines, who have served the United States in any war, and who have been residents of the state for one year immediately preceding the date of application [for admission to the home], who may be disabled or destitute." The wives of such veterans were also eligible for admission, provided that they were at least 45 years old and (in 1901) had married the veteran before 23 February 1895. Meals were served in the main dining room. Here is the "bill of fare" for December 1901, as it appeared in the Home's annual report that year. Breakfast was generally "oat flake" or "wheat flake." Dinner (the noon-time meal) seemed to be the biggest meal, with a meat, a vegetable, a starch (or two), tea, and coffee. Supper (the evening meal) was usually soup or hash, with a fruit or vegetable, bread, and coffee. You can find some records of the Indiana State Soldiers Home on the military section of the IGS website. (Scroll down to "State Soldiers Home.") These databases are available to IGS members. What do you think? Could you handle eating the meals on this menu? 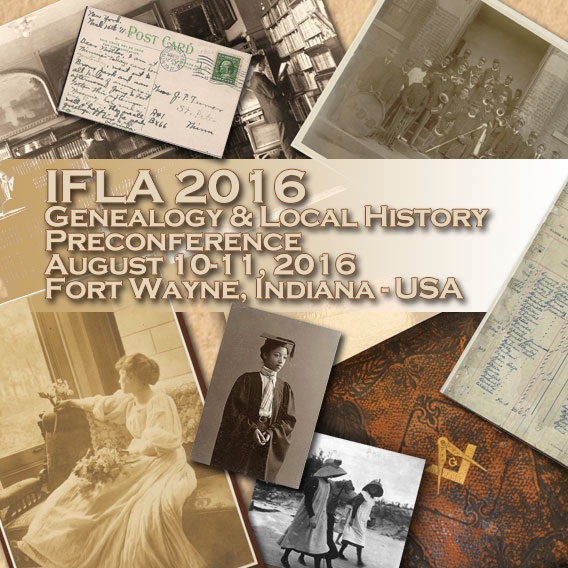 The Allen County Public Library is pleased to support an IFLA (International Federation of Library Associations) Genealogy & Local History Preconference on August 10 – 11, 2016 in Fort Wayne, Indiana. The preconference is free to attend. This preconference will feature presentations and discussions on technologies and strategies for finding, saving and presenting (1) records, (2) family histories and (3) living memory in the twenty-first century as well as how these resources are made available worldwide. Come for the first day of interactive presentations and stay for the second day of unconference sessions and tours if your schedule permits. International organizations will discuss their current efforts, technologies, and resources; state and regional organizations will demonstrate successful projects; and a second group of offerings will highlight the importance of story and interviewing techniques for preserving life stories. A theme woven through this preconference is recognizing and building virtual information networks to both preserve and present records, stories, and living memory. The staff of The Genealogy Center, the Allen County Public Library, and the entire Fort Wayne community invites you to take advantage of this great opportunity. How could I get copies from the Monroe County, IN, Court records (1818-1875)? It is on their webpage without a single indication as to how. (The dates alone would be extremely valuable to our research) Thank you! I have been researching my family history but come to a dead end in Indiana. My great grand father was David Hammon, born in Pennsylvania in 1815, but he lived in Indiana. All his children were born in Indiana. His father died in Indiana; his name was either Henry or Jacob. My great grandmother was Roseana Moyer; they were married in Ohio but had all their kids in Indiana. I have found reference to them living in Kosciusko County. There are many Hammon families living in Indiana, and I don't know it they are related or where they came from, as the place of birth changes from the different census’. Any help in sorting out this would be helpful or some documentation confirming who’s who would be very helpful and greatly appreciated. I am a disabled vet and this is part of my therapy-to find my history-but I am unable to travel, so my search is strictly thru the Internet. This query concerns Amos Myers (b. 1800, Davidson Co., N.C.-d. abt. 1880, Ray Township, Morgan Co., IN). He is buried in Gosport Cemetery, Owen Co., IN. Based on land records, he moved from Rowan Co., N.C. to Indiana about 1827 and purchased land in Morgan and Owen counties. He married his wife Sarah in Rowan Co., N.C. in 1819, and his second wife Julia A. Browder in Indiana in 1858 in Morgan Co., Indiana. I am seeking any further information on Amos, but specifically a record or other documentation connecting him with his son, Alfred Myers. Alfred was born in Indiana about 1831, presumably in Morgan or Owen County, moved to Texas in the 1850s, then on to Kansas, then back to IL. He died in 1876 in Jasper Co., IL. Any advice on where to find information connecting Amos to his son Alfred or information as to who may be able to help me would be welcome. I am happy to share my research on this Myers family, which I have documented as far as Revolutionary War patriot and Indiana Pioneer Jacob Myers (b. ca. 1735, Germany-d. 1838, Franklin Co., IN). Thank you. I am looking for stories, pictures, anything to humanize the Bough family that lived in the Lawrence County area during the Limestone Quarry boom times. I believe 1880 - 1920 would cover that time period. They also migrated over to railroad work, with many of them becoming brakemen, switchmen, and even a conductor. It starts with John W Bough, who started as a Farmer and became a Teamster at the mines, 1853-1939; his son, Lewis Bough (often misspelled Louis), 1880-1929; and his brothers, Winfred, Pinkney, Bert, Everett, and sister, Mary. Lewis had three sons, John, Elwood and Fredrick 1915-1977. I'm very interested in Lewis, and what happened to John and Elwood, along with Lewis's brothers, and the Patriarch John W Bough. I have lots of census, birth, marriage and death records, but not much else. Thanks. Browsable listings of county prosecutors, county sheriffs, Indiana State Police, and other law enforcement officials, as listed in an Indiana Railroad Police Association directory. This database was contributed by Sue Caldwell. 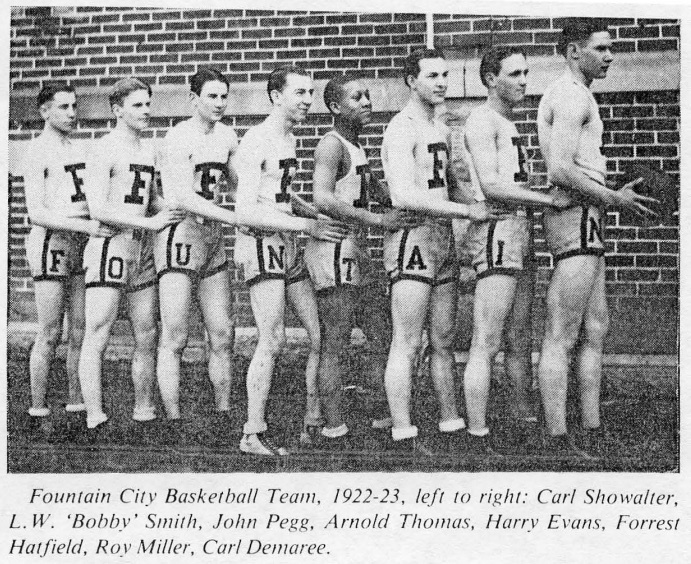 Browsable listings of students who graduated from Fountain City High School (which became Whitewater-Fountain City High School in 1964), as listed in a sesquicentennial history. This database was contributed by Wayne Klusman. An index of 64 students who graduated from Oakland City College, as listed in the school's 1952 commencement program. The index includes their hometown and the degree they received. An index of 83 students who graduated from Valparaiso University, as listed in the school's 1940 commencement program. The index includes the degree they received. An index of 107 students who graduated from Marion Normal College, as listed in the school's 1908 commencement program. The index includes the subject of their study. NOTE: Marion Normal College later became Indiana Wesleyan University. Browsable listings of members who died, as listed in semi-annual reports of the Independent Order of Odd Fellows. This database was contributed by Ron Darrah. Browsable biographical entries of early teachers, professors and other educators, as listed in an 1875 history. This database was contributed by Ron Darrah. An index of prisoners who died at the Indiana Women's Prison, as listed in the institution's annual reports for 1877 through 1891. The index includes their date of death, cause of death, and age (if known). Browsable digital images of students in grades 8 through 12, as listed in North Madison High School's 1931 yearbook, Releef 1931. Only the students in grades 11 and 12 are identified by their full names; students in grades 8 through 10 are only identified by their last names. This database was contributed by Ron Darrah. Browsable digital images of teachers in grades 8 through 12, as listed in North Madison High School's 1931 yearbook, Releef 1931. This database was contributed by Ron Darrah.